From award-winning author Philip Jose Farmer comes his most famous science fiction work: the first combined edition of the first two Riverworld novels, To Your Scattered Bodies Go and The Fabulous Riverboat. Imagine that every human who ever lived, from the earliest Neanderthals to the present, is resurrected after death on the banks of an astonishing and seemingly endless river on an unknown world. They are miraculously provided with food, but with not a clue to the possible meaning of this strange afterlife. And so billions of people from history, and before, must start living again. Some set sail on the great river questing for the meaning of their resurrection, and to find and confront their mysterious benefactors. On this long journey, we meet Sir Richard Francis Burton, Mark Twain, Odysseus, Cyrano de Bergerac, and many others, most of whom embark upon searches of their own in this huge afterlife. The basis of the 2010 television miniseries from Syfy. 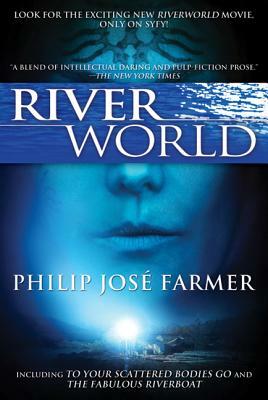 Hugo award-winning author Philip José Farmer (1918-2009) was one of the great science fiction writers of the 20th Century, and the Riverworld books are generally considered his masterpiece. He lived in Peoria, Illinois.